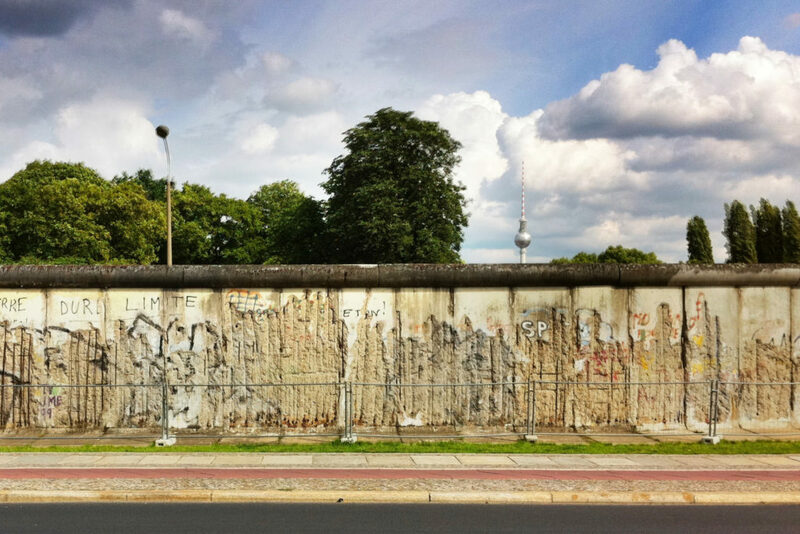 There are a few options to go if you want to see, what the Berlin Wall looks like today. The official site to however is the Berlin Wall Memorial at Bernauer Strasse. This is the place to go, if you would like to see the Wall together with quite a stretch of the original death stripe, along with an original watchtower. The memorial site basically stretches along Bernauer Strasse between Ackerstrasse / S-Bahn station Nordbahnhof and Brunnenstrasse / U-Bahnhof Bernauer Strasse. You can easily spent a few hours, walking up the memorial site. There is also a Visitor Center and a Documentation Center situated in two different buildings. So you should take some time to let it all sink in. The Berlin Wall Memorial site consists of a few different parts that I would like to mention here. Walking up from Ackerstrasse / S-Bahn station Nordbahnhof you will first see a row of metal bars on the right side of Bernauer Strasse. This line of metal bars symbolizes the very location where the Berlin Wall was once located. To the left you will find the Visitor Center. But once you are here you could first turn even further to the left. You may be familiar with the almost iconic look of the concrete wall – but the yellow brick wall that runs down Ackerstrasse was also part of the Berlin Wall. Anyways. Walking up Bernauer Strasse you will soon reach the part of the Berlin Wall Memorial, that has parts of the original Wall built in – both renovated and in original shape. Having a closer look, you will actually see the cracks and holes people left when the wall was torn down in 1989. On your way up Bernauer Strasse you may recognize small metal plates and metal stripes in the pavement and in the green. The metal plates commemorate people that died when trying to flee from East Berlin to West Berlin. The often feature a date and/or a name on it. The metal stripes however indicate where escape tunnels were located – how many people fled through that tunnel and when is was discovered by the East German border patrol. At the crossing of Bernauer Strasse and Brunnenstrasse you will find a model of the area. Have closer look and you will recognize the streets, the buildings, the watchtowers – and where the Berlin Wall once was located.